Home alessia allen solly color fetish Fashion handbags Limeroad.com max red rage Shopping When in doubt , wear RED ! And this one is my top favorite bling clutch! Bought from Allen Solly at Garuda Mall ! Another red bag I own is a U bag I bought from FashionAndYou.com ! Its the most comfy handbag ever ! No idea what the material is but such a bag is a must in every woman's wardrobe! 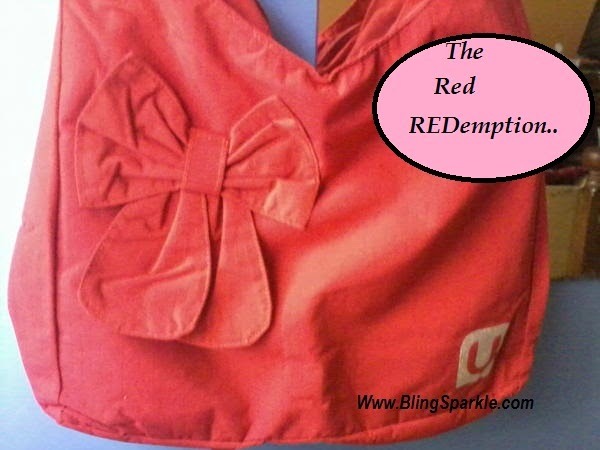 The bow adds to the beauty of the bag. LOVE ! This cutie metal strap handbag is unbranded and the what a beauty it is ! Comfy and stylish , bought from abroad! This one is a jute bag by Earthen Me ! Superlove , very handy ! It makes grocery shopping funky and fun also I carried a few times to college! Look ma, I is eco friendly too LOL! Before I end the Red bag rage , remember what Bill Blass had to say about red ? Do you own bags in red too? Okay I know you would own a lot more shoes in red than handbags yet 2 or 3 bags in red are a must for us women , isn’t it ?